This handbook is designed so that teachers, parents, and health care professionals struggling with the everyday frustrations of working with students with ADHD, TS, and/or OCD can create greater success. This reference book contains brief chapters on the definitions of and research pertaining to the disorders and their associated problems. It provides practical suggestions and strategies which enhance academic success. This supplement provides checklists that were developed to help teachers, parents, and other professionals set goals, identify appropriate intervention strategies, and create an effective educational program for the student who is experiencing difficulties in the classroom and at home. This supplement provides comprehensive recommendations for addressing deficits associated with executive dysfunction, slow processing speed, and memory problems in students. Each highlighted test provides the diagnostician with the appropriate age range and a list of abilities required for the student to perform successfully. 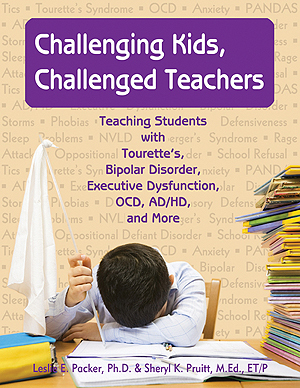 This book is an educator’s go-to source for creating a supportive environment to successfully teach children with multiple neurological disorders including Tourette’s Syndrome, OCD, ADHD, LD, Nonverbal Learning Disability, Pervasive Developmental Disorders, Asperger’s Syndrome, Anxiety Disorders, Depression, Executive Dysfunction, Sensory Processing Disorder, Pediatric Autoimmune Neuropsychiatric Disorder Associated with Strep (PANDAS), Bipolar Disorder, “Storms” or “Rages”, Oppositional Defiant Disorder, and Sleep Problems. Parents, school psychologists, and social workers will also find this book essential reading. The book is designed to provide lots of practical ideas to incorporate in a student’s plan and also has sections on accommodations for homework, tests, sleep problems, and the almost-always present handwriting problems. The book provides information to teachers and parents to aid in the teaching of students with attention deficit hyperactivity disorder, Tourette Syndrome or Obsessive-Compulsive Disorder. Tiger Trails is a wonderful introduction to the vocabulary used with TS+, a short hand term for Tourette syndrome plus everything that can go with it, e.g., Obsessive-Compulsive Disorder and ADHD. As Darin states in the preface, these are “the words for the first 90 minutes of the TS conversation” after the diagnosis. For more information about other titles available from Parkaire Press, visit www.ParkairePress.com.